Today I thought I’d share with you some of my favorite thrift store finds that I’ve picked up either recently, or over the past few years. I love a good bargain and the hunt of thrifting! I enjoy styling pieces that are unique and tell a story that can’t be bought from a chain store - I think it gives a home such a cozy, gathered feel. In high school and college, I would go to thrift stores so often (almost on a weekly basis) and I bought anything and everything I found that was remotely cute because - why not? it’s cheap! I ended up with a bedroom (and eventually entire home) filled with so many home decor and clothing items that I didn’t love. I ended up returning everything back to the thrift once we started to clean out everything a few years ago. Now I go to thrift stores with a list of specific items and only grab what I absolutely love. I want items that are going to serve our home for the long term and add value to our lives. If a piece is trendy and I can imagine myself getting rid of it within the next year or two, I don’t buy it (unless I’m madly in love with it). Long term, I want thrifting to save us money - I fell into a habit of constantly dropping off items only to pick up more on my way out, so having a running list is extremely helpful and slows down the buying process. So here are my favorite thrifted items in our home and where we use them! I always try to grab baskets that are nice and clean. They can be used in so many ways around our home: planter, clothes hamper, or for blankets in our living room. I also have a smaller one (pictured below) that holds all of Jude’s diaper changing items. Love baskets to hide and organize things! Joshua found our reading lamp - he loves to find lamps and chairs and has great taste, so it’s always fun to see what he can find while thrifting too. One of my favorites! The perfect little stacking mugs in the nicest shade of tan. I love anything speckled, so these were so fun to find. I purchased them right after we were married and I’ve loved layering and mixing and matching them with different sets. Apparently I have a thing for Japanese Stoneware. This dresser was such an exciting find for me. I wanted to find a mid-century piece with these specific legs - I’m so picky when it comes to furniture details. I found it about three years ago at Goodwill when Joshua and I were newly married - since it was pretty damaged, we painted the exterior white and left the drawers the original wood. I used to keep my folded clothes in it, but now it contains all of Jude’s things. I love that we can move and reuse it in so many ways around our house. I can’t remember the price, but I’m sure it was under twenty bucks. The globe is a gift from my mom - another second-hand find. Who doesn’t love a gold mirror? I found this one a few months ago for around fifteen dollars. Mirrors can be expensive, so I would never be afraid to check your second-hand stores for them. These were so inexpensive for how nice they are - every home needs a nice set of candlestick holders to make dinner time fancy! Found this one for around fifty dollars - the wood is pretty worn and the cushions were in bad shape, so I made new covers for the seat out of white vinyl that is easily wipeable (I get questions about it all the time since we keep it in Jude's room). I love mixing old with new and I don’t mind that the arms are slightly worn. 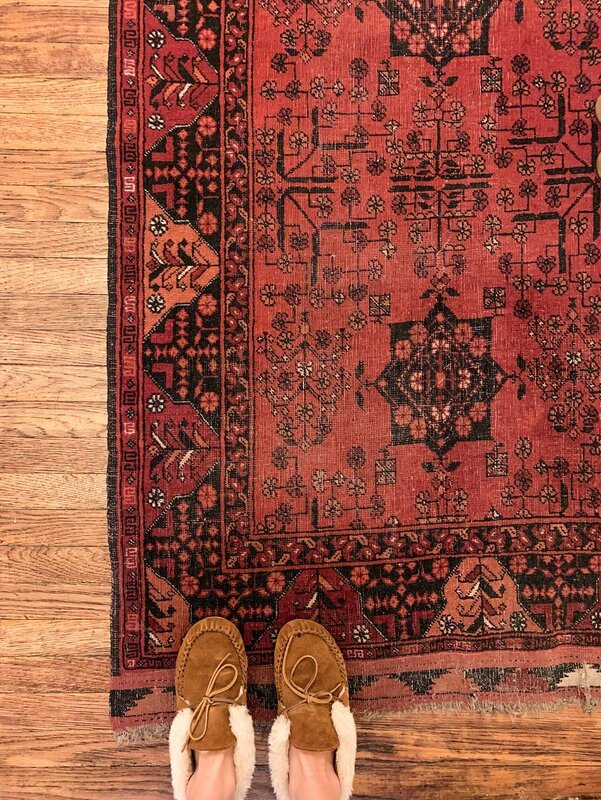 Last (but defiantly not least), is our entryway rug. This is one of those items l will keep for forever - I remember laying it down in our hallway and feeling so satisfied with how perfectly it fit the space and our home. A seventy dollar steal for how much joy it brings me. Hope you all enjoyed! Let me know any special finds you’ve scored at a secondhand store! I love to hear from you all. I’m thinking it might be fun to do another post on clothing that I’ve found - let me know if that’s something you would be interested in!